He and four other Wesleyan students were accepted through a competitive application process. They attended plenary sessions, working sessions, and other special events that enabled them to network with their peers, build skills, and identify potential partners. Other Wesleyan attendees included Anthony Price ’20, Katie Shewfelt ’20, Momi Afelin ’19, and CGI U campus representative Ferdinand Quayson ’20 and Makaela Kingsley ’98, director of Wesleyan’s Patricelli Center for Social Entrepreneurship. The Wesleyan students joined more than 1,000 others from around the country for a weekend of networking and inspiration. Through his organization, Be the Change Venture, Price works to connect and empower young people to be leaders in their communities and become successful in the workforce. Featured speakers included former U.S. President Bill Clinton, founder and chair of the Clinton Foundation; Chelsea Clinton, vice chair of the Clinton Foundation; and former U.S. Secretary of State Hillary Clinton. During the conference, the attendees also attended a lunch hosted by Peapod cofounder Andrew Parkinson ’80. Several alumni gathered at Peapod’s headquarters to hear from our students, and learn more about the landscape of social entrepreneurship at Wesleyan today. Additional speakers included Muzoon Almellehan, UNICEF Goodwill ambassador; Amy Carter, deputy director of Family Interest Grants, Community and Civic Engagement at the Bill and Melinda Gates Foundation; Julio Martinez Ellsberg, member of the International Relations Commission; Susan Herman, president of the American Civil Liberties Union; Uzodinma Iweala, CEO of The Africa Center; Mai Khoi, an independent artist and activist; Jens Ludwig, director of the University of Chicago Crime Lab and McCormick Foundation Professor; and Lt. Col. Joe Plenzler, retired Marine Corps combat veteran and cofounder of #VetsForGunReform. 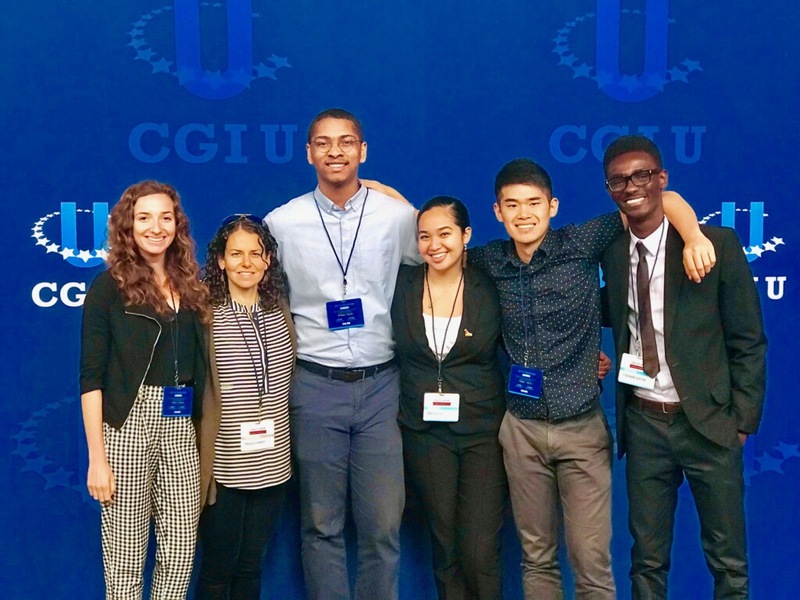 This is the second year that Wesleyan students participated in the CGI U conference. In the 11 years since CGI U began, Wesleyan students have participated on a number of occasions. Early attendees included SHOFCO co-founders Kennedy Odede ’12 and Jessica (Posner) Odede ’09. In 2017, AJ Wilson ’18 won a Crowdrise fundraising competition for his organization Dream Chasers, and was congratulated by Bill Clinton, Chelsea Clinton, and Congressman Joe Kennedy III. For more information on CGI U, contact the 2019 campus rep, Anthony Price ’20, at adprice@wesleyan.edu. Note that CGI U is especially interested in working students interested in tackling the opioid epidemic. Such commitment-makers may have opportunities to partner with the Clinton Foundation and Clinton Health Matters Initiative (CHMI) networks.